With Collingwood forming a sister relationship with the Glasgow Magpies (formerly Glasgow Redbacks) the Scottish Australian Football League (SARFL) has started the year with a blast and is looking forward to a lively 2007. The 2006 season proved a bit of a watershed for the game in Scotland, with an expanded 5-team league structure, a further successful staging of the pre-season Scottish Cup, and the entrance of a new, second team in Glasgow. 2006 started with the invitational pre-season cup, staged in March at Glasgow’s Victoria Park oval for the first time. The park, which had a dedicated footy oval with full posts completed only the day before the competition, saw its first game take place between the Edinburgh Bloods and Dublin Demons, the latter making the trip across for the competition. Also competing were the hosts, the Glasgow Sharks. The Bloods and the Demons contested the final, a hard-fought encounter, with the Irish side winning through in the end to claim the Haggis Cup. The SARFL home and away season started only a matter of weeks later. Previous entrants the Sharks, Bloods and Edinburgh Bodysnatchers were joined in the fray by the new Glasgow Redbacks side, as well as the fledgling Middlesbrough Hawks team. The Hawks entered with an almost entirely UK-based team, with only small numbers of Australians on hand to develop the side. The season started with two derbies though, as the Sharks took on the Redbacks, while the Bloods played the Bodysnatchers. The Sharks were pushed hard by the Redbacks, but won through with 2 late goals, while the Bloods easily saw off their cross-town rivals. But as the season progressed the Bloods, Redbacks and Bodysnatchers stamped their dominance on the ladder. The Redbacks inflicted a 100+ point defeat on Middlesbrough in the latter team’s first game of Aussie Rules, while both the Bloods and Bodysnatchers saw off the Sharks in successive weeks. Enduring a tough time of it due to injuries in 2006, the Sharks even suffered a surprise loss at the hands of the travelling Hawks on their own home ground. While it was disappointing for the Sharks, it was encouraging to see a team of players so new to the game work as a unit to bring out a result against an experienced side. One of the games of the 2006 season saw the Sharks take on the Redbacks in the second Glasgow derby. It was a thriller and went down to a last second torpedo punt from Redback’s Anthony Mercuri to secure the last-gasp behind that tied the game. The game had ebbed and flowed throughout, and the result was proof that the well-balanced draft which had taken place at the start of the season had been the right thing to do for the good of the game, creating a truly competitive environment between the two sides throughout the season. The same was true in Edinburgh, where the Bodysnatchers trailed the Bloods all season, but grew as a unit as the season progressed, narrowing the Bloods' lead right down to the last game. The season saw a preliminary final between the second and third placed sides, with the winners meeting the top side in the Grand Final. In the end, the Edinburgh Bodysnatchers faced the Glasgow Redbacks in the preliminary final, a game which saw the Bodysnatchers hitting near top form and easily beating the less experienced Redbacks side. That set up a tasty Grand Final encounter with the Edinburgh Bloods, a side which the Bodysnatchers had yet to beat that season. The Bloods started the Grand Final strongly and took an early lead, and extended it in the second quarter. However the Bodysnatchers knuckled down and narrowed the Bloods' lead to 11 points at 3 quarter time. A storming final quarter saw the Bodysnatchers hit their best form of the season with 6 unanswered goals and a bumper end to their season, turning around the deficit to lift the SARFL cup as Premiers. It was the first time a side other than the Bloods had won the SARFL. On the international front, 2006 saw the Scottish Puffins enter sides in both the Anzac and Brit Cups. While the Anzac series ended in defeats for the under-strength Puffins, the Brit Cup did bring a win as they beat the North London Lions to register their first win for 2 years. The national side, forming a link-up with Essendon in 2006 and donning that side’s colours for the first time, will be looking to go even further in 2007. Further good news for Scottish footy pride was our first ever SARFL/Scottish player to represent Britain. Glasgow Sharks player Ross Thomson achieved this when he was a member of the British Bulldogs team which faced Ireland in the Geelong versus Port Adelaide curtain raiser in London in October 2006. Hopefully the first of many as Scottish footy begins to pull its weight in Britain. 2007 has started well for the SARFL. One of the Glasgow sides has just agreed an affiliation with Collingwood, meaning that the Redbacks are no more, with their place at the SARFL table now taken by the Glasgow Magpies. The Collingwood link-up will hopefully raise the profile of the SARFL in the game’s home Australian market, making it easier to attract Australians in Scotland as well as Scottish players. The annual pre-season Scottish Cup will again be staged in 2007, with a date in late April seeming to be the most likely. Glasgow will again be the venue, and interested parties are asked to email the SARFL at info@sarfl.org.uk to register their interest and to be kept informed. The competition is open to all, but entry will be restricted to the first six teams to confirm their entry. It is expected to be a 14 or 15 a side competition at which at least one third of each team must be made up of non-Australians. It is certain to be a good day again. 2007 will at least be a year of consolidation for Scotland, but is expected to be the year that finally brings the game to that country’s attention. 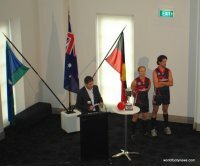 Such a rugby and soccer-rich country will have a wealth of talent to draw on and the challenge for the SARFL will be to successfully continue to raise the profile of Aussie Rules in that region.